If you’re looking for a top quality, high performing dishwasher then look no further than the HFC3C26W from Hotpoint. This particular model has a white finish, but this is also available in silver. As a full-size freestanding model, this fits into a standard 60cm wide gap in your kitchen. 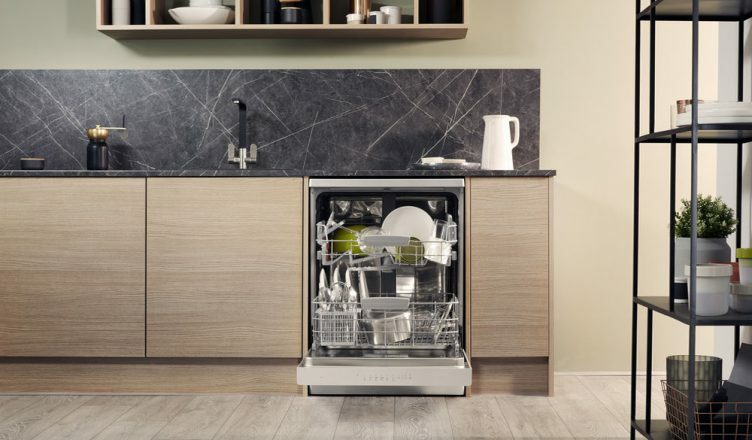 If you are after a slimline model instead, you can view our Hotpoint dishwasher range here– there’s something to suit every household with built-in ranges too, and a choice of place-settings on most types. If you’ve been thinking of getting a dishwasher but are worried about the energy and water used, then this might just be the product for you. With ‘A++’ energy rating and ‘A’ rated cleaning and drying performance plus Eco settings, this is actually a very economical machine to run. This has a large 14 place setting capacity so you can fit lots of crockery and pans in per load too! With 7 main programmes including Eco, Intensive, Normal, Fast, Express, Sanitizing and a Soak option there’s a program to suit every need. If you only have a small load to wash, you can use the EXPRESS 30 program for lightly-soiled dishes – it’s ideal for 2 place settings. The Eco setting is a good every-day option to keep your energy and water usage to a minimum. 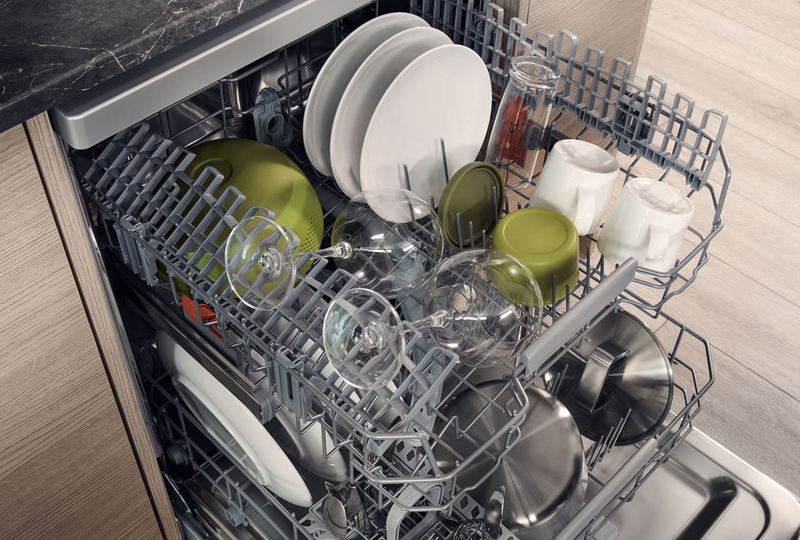 You may be surprised to find out that modern dishwashers have become so energy and water efficient that it’s very hard to beat that efficiency through hand washing – particularly if you use the Eco setting and try to always run a full load. An energy efficient setting actually uses around a third of the water that would be used when washing up in a sink! A handy feature of this model is the Delay Timer which lets you set the dishwasher to come on at a convenient time – this lets you delay the start by anything between 30 minutes to 24 hours. This also have a Silent motor giving it a really low running noise level so you can even run this overnight. The FlexiLoad space saving design lets you change the internal setup of the baskets and racks – ideal for large pots and pans. It even has a Vertical Zone to let you place your pans vertically which is great for freeing up space and squeezing some extra items in. As well as this, the Hotpoint HFC3C26W gives you a whole host of stacking functions, including adjustable rack heights, foldable flaps with adjustable positions for various types of glassware and cutlery baskets with grills for improved cutlery arrangement. The display is very clear and the user panel is easy to use with push button controls. There are salt and rinse aid indicators and a digital countdown timer. The latest Hotpoint dishwashers also feature their 3D Zone Wash Technology. This tech delivers up to 40% more washing power though the additional water jets on the bottom of the internal cavity. With the Hotpoint HFC3C26W, you get a reliable, energy efficient dishwasher ideal for most families. If you’re in a rush, you have a 30 minute quick wash option – or simply use the timer delay to turn on the machine automatically when it’s convenient; this gets your dishes sparkling while being gentle on the environment – and your wallet! You can buy the Hotpoint HFC3C26W online or use Click & Collect to pick up in as little as one hour. Stay up to date with the latest tech and get worry-free servicing on your machine when your rent this Hotpoint dishwasher for £4.62 per week or ask your local store about a demo.